King Thomas Edgar Brown, National Khoisan Nation Monarch (left), and Rev. Fred Shaw Jr., CCHR spokesperson, protested psychiatric drugging of South African children. A king and his people joined CCHR, making their voices heard protesting at the World Psychiatric Association’s International Congress, to protect their future generation. King Thomas Edgar Brown, Monarch of the National Khoisan Kingdom in South Africa, joined a children’s rights march outside the Cape Town International Convention Centre where the World Psychiatric Association (WPA) International Congress was being held. 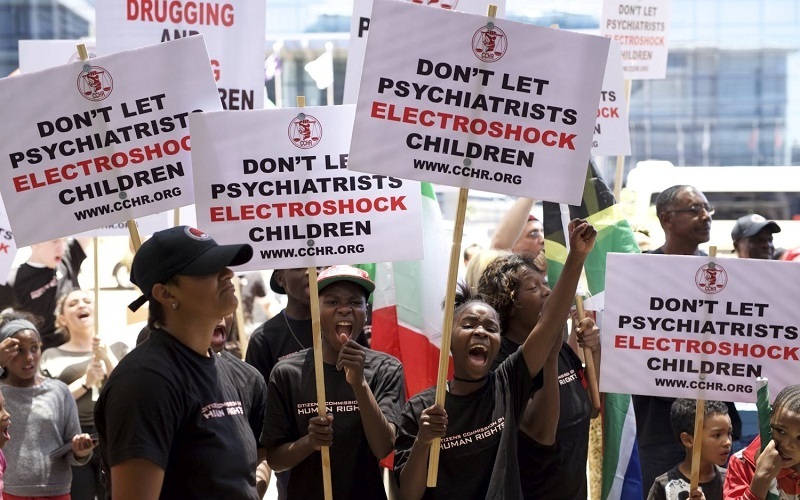 The march, organized by the Citizens Commission on Human Rights (CCHR), protested the increasing psychiatric labeling and drugging of South Africa’s children. The rate of children being prescribed stimulants, which experts say are more potent than cocaine, is astoundingly greater than that even in the United States. The king issued a heartfelt message, “We need to stop the senseless maiming of people, including children, by psychiatry. CCHR will take the lead and I will direct my people to be alert to this.” Rev. Fred Shaw Jr., international spokesperson for CCHR, and past President NAACP Compton, California branch, applauded King Brown’s concern for the future of his people. Rev. Shaw flew to Cape Town to warn South Africans about Western psychiatric trends. This includes labelling children with “Attention Deficit Hyperactivity Disorder” (ADHD) and prescribing stimulants like Ritalin or antidepressants for “depression.” Children and adolescents are still prescribed the drugs despite a 2005 “Drug Alert” from South Africa’s Medicines Control Council about SSRI antidepressants putting adolescents at increased risk of suicide. Rev. Shaw helped CCHR present written testimony in 1997 to the South African Truth and Reconciliation Commission Hearing about psychiatry’s role in apartheid. He warned then of the risks of South Africa adopting psychotropics (mind-altering drugs) in the post-apartheid era. “Psychiatrists admit they do not have any medical test to confirm ADHD or any mental disorder, nor do they have any cures. However, the drugs they prescribe have been linked to suicide, violence, heart conditions, high blood pressure, loss of appetite and psychosis,” he said. CCHR has long stood for the protection of children from psychiatric abuse. With 20 million children worldwide on psychiatric drugs and billions in profit made off this “market segment” by psychiatrists and pharmaceutical companies, youth are a prime target. And with recent pushes to mainstream electroshock (ECT) for children, such as by the American Psychiatric Association to reduce the risk classification of the ECT machine, children are more vulnerable than ever. While family members have always formed a foundation of protest against psychiatry, a new voice has joined the cause—youth are standing up for themselves and saying “No!” to the dangerous and ineffective practices of psychiatry.